This NASA artist concept for the agency's 2020 Mars rover is loosely based on the Curiosity rover in the Mars Science Laboratory mission. NASA officials will discuss plans for the next big U.S. rover to land on Mars, a car-sized robot slated to launch toward the Red Planet in 2020. During a teleconference today at 3 p.m. EDT (1900 GMT), scientists will "provide details about a report that will help define science objectives for the agency's next Mars rover," NASA officials said in an announcement. You can follow the Mars 2020 teleconference live on SPACE.com here, courtesy of NASA. 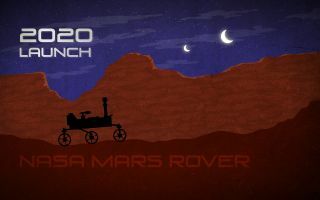 This NASA artist's sketch for a Mars rover launching in 2020 is loosely based on the agency's Curiosity rover built for the Mars Science Laboratory mission. NASA's Mars 2020 rover is a solar-powered robot expected to be based heavily on the agency's Mars Science Laboratory mission, which landed the $2.5 billion Curiosity rover on the Martian surface in August 2012. Curiosity is a 1-ton rover about the size of a Mini Cooper car that is equipped with 12 different science instrument sets, including a suite of cameras, a mast-mounted laser and a drill on its robotic arm. The huge rover landed on Mars in a completely new way, using a rocket-powered sky crane to hover over the Martian surface while Curiosity itself was lowered to the ground on cables. Mars 2020 is expected to use a similar system. Because of the Mars 2020 rover's anticipated similarity in design to Curiosity, the new robot is expected to cost about $1.5 billion, significantly less than its predecessor, NASA officials have said. "Designed to advance high-priority science goals for Mars exploration, the mission would address key questions about the potential for life on Mars," NASA officials explain in a mission description. "The mission would also provide opportunities to gather knowledge and demonstrate technologies that address the challenges of future human expeditions to Mars." Jack Mustard, SDT chair and professor of geological sciences, Brown University, Providence. R.I. The Mars 2020 rover is one of several NASA missions aimed at the Red Planet currently under development. Later this year, NASA will launch the Mars Maven orbiter to study the Martian atmosphere in unprecedented detail. In 2016, the U.S. space agency will launch the Mars InSight lander to drill deep into the Martian surface. The European Space Agency, meanwhile, is working with Russia on its ExoMars missions to launch an orbiter and rover to Mars in 2016 and 2018, respectively. India is also planning to launch its first Mars orbiter in the upcoming years. Meanwhile, NASA's Curiosity rover and Opportunity rover are currently exploring the surface of Mars while spacecraft from NASA and the European Space Agency orbit the Red Planet.